Nations Press feature news GOOD NEWS:TESDA Offers Online Courses for FREE,Find out How. 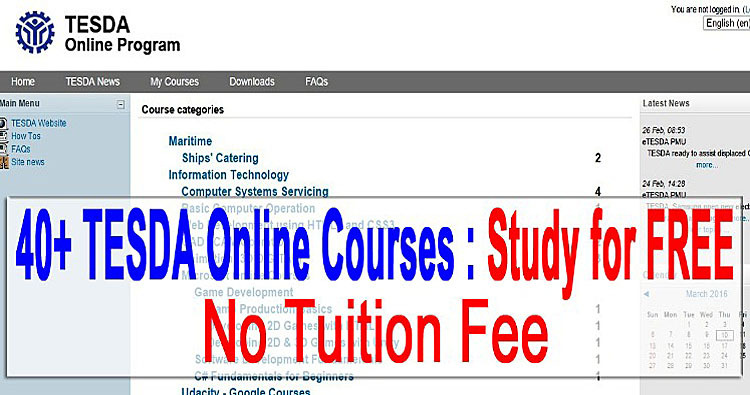 GOOD NEWS:TESDA Offers Online Courses for FREE,Find out How. Good news to our fellow Filipino who wants to add knowledge of their education and learn more about Information Technology, Web Development with use of HTML5 and CSS3, knows how to design anime and move like a real human by learning Animation 3D and many more. This Technical Education and Skills Development Authority / TESDA Online Program has been there for quite long time but never had an official launch that’s why few of us are not well-known on the said program. This government organization was helping since then by providing scholars and technical course but only this year TESDA will came out big in terms of online education. For inquiries and other concern, visit Tesda Online Courses Program website www.e-tesda.gov.ph or you can send email to etesdapmo@yahoo.com also you may call +632 – 3837839. Also applicants may visit Tesda schools near your area.